Actually, it’s been just over 15 years since Brabus, long-time creator of the most mental examples of Mercedes in existence, has been building heated-up Smarts, so this Brabus 125R, of which just 125 will be built, is something of a celebration model. 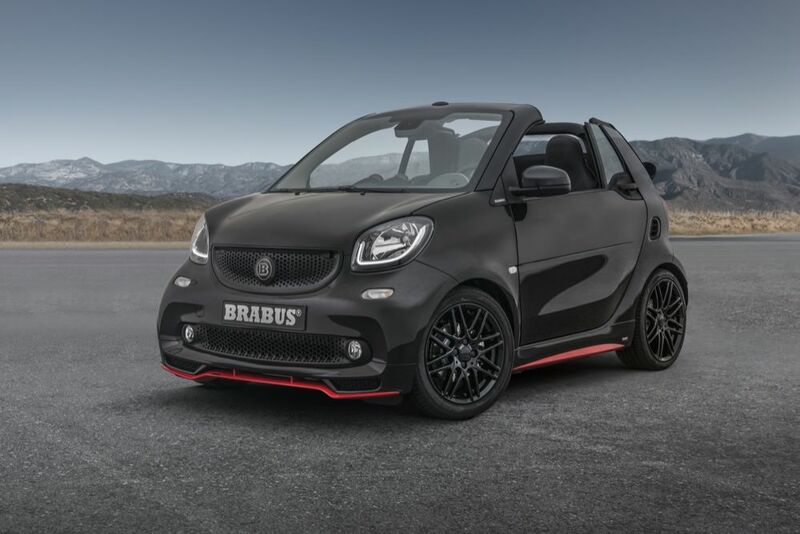 It’s based on a ‘Club Sport’ track day version of the Fortwo that Brabus created for a media event at the fearsome Bilster Berg race track in Germany last year, and the Pocket Rocket moniker isn’t just a silly nickname, as it’s also a link to the iconic 2006 Mercedes CLS-based Brabus Rocket V12-engined missile, which set a world speed record for four-door saloons. The Brabus 125R Smart sees its three-cylinder turbo engine tweaked to 125hp, and 200Nm of torque, good enough to push the two-seat cabrio to 100km/h in 9.2 seconds. The top speed is electronically limited to 175km/h. To get that kind of performance, Brabus developed a modified intake system, an even more efficient intercooler and a recalibrated engine control unit. For further performance optimisation and for an especially sporty sound at the touch of a button, the engine was fitted with a stainless-steel Brabus sport exhaust system with actively controlled flaps. To match the three cylinders of the engine, this exhaust system features three centre-exiting exhausts. The wheels are 16-inch monoblock alloys at the front, with 17-inch versions at the back, fitted with bespoke Yokohama high-performance tyres. The suspension has been lowered by 30mm and fitted with Brabus sports springs. Outside, there is a front spoiler, side sills and exhaust surrounds, along with carbon-fibre wing mirror covers. The cabin gets contoured sports seats, with contrasting red seams and diamond quilting, and there’s a red 12-o-clock marking on the leather steering wheel. There’s also a carbon-fibre look for the dashboard, anodised gear shift paddles and handbrake lever, and velour floor mats with the Brabus logo. The Bugatti Divo is slower but better for drivers. August 25, 2018 Dave Humphreys Comments Off on The Bugatti Divo is slower but better for drivers.